Unbeknownst to many I am an instructional game designer, next to PhD writing coach. Specifically, I design ‘serious games’; games to help people learn. 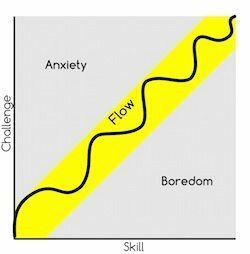 While reading up on game design, I recently encountered the concept ‘flow’. Flow, or the lack of flow (writer block) is also well-known to writers. How the term flow is used in game-design, can help us to understand writing flow. Flow was coined by psychologist Mihaly Csikszentmihalyi. It describes a state in which you are completely focused on a task, purposefully losing track of your surroundings and time. It is an optimal state to be productive. Flow is attained when there is an optimal balance between your own skill level and the challenges you face: not too easy, not too difficult, just right. Games are really good in producing this state. Games have clearly defined goals and keep your mind and hands engaged, without any distractions. They automatically adapt the difficulty to your skill level and give you continuous feedback on how well you are doing, such that you can adapt your behavior to stay ‘in the flow’. Moreover, games continually mix hard challenges with periods of reward and relaxation, just enough to keep your flow passage interesting. Good games are in essence ‘flow-creators’ in optima forma. Compare this to the setting a PhD student can find him- or herself in. Often, the goals of a PhD project are unclear and distractions of colleagues and non PhD tasks are right around the corner. PhD-students are regularly left with too challenging (‘Please write this full paper’) or too boring tasks (‘Can you please sort the stimuli for me’). Feedback can be sporadic, dependent on the available time and supervision style of the supervisor. The result is that a PhD-trajectory can feel like a flow rollercoaster, ranging from extreme anxiety right before a deadline, to utter boredom when waiting for data. At Artisa, many PhD students refind their flow. As a PhD student, we help you set your goals and make sure you are not distracted. We offer you the freedom to work at your own pace, helped by clear and direct feedback, adapted to your skill level and needs. You can combine periods of ultimate productivity with periods of full relaxation, for you to choose depending on your flow state. As such, Artisa is a ‘flow-creator’, much like games. I wholeheartedly wish you flow in writing, just like I found when first visiting Artisa. Our dissertation writing weeks in Spring 2019 are held from April 20th to April 27th with dr. Miriam de Boer and from May 18th to May 25th with dr. Frank Leoné. For more info or to subscribe send us a mail. You can also give us a call.